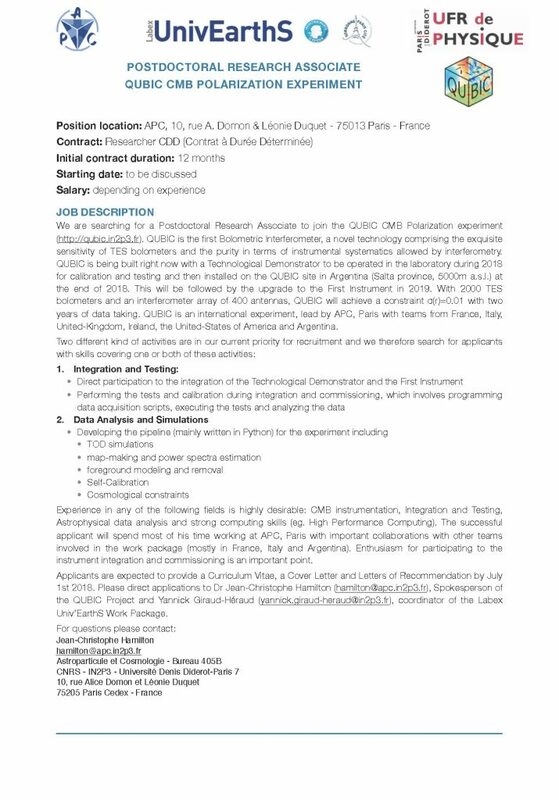 We are searching for a Postdoctoral Research Associate to join the QUBIC CMB Polarization experiment (http://qubic.in2p3.fr). QUBIC is the first Bolometric Interferometer, a novel technology comprising the exquisite sensitivity of TES bolometers and the purity in terms of instrumental systematics allowed by interferometry. QUBIC is being built right now with a Technological Demonstrator to be operated in the laboratory during 2018 for calibration and testing and then installed on the QUBIC site in Argentina (Salta province, 5000m a.s.l.) at the end of 2018. This will be followed by the upgrade to the First Instrument in 2019. With 2000 TES bolometers and an interferometer array of 400 antennas, QUBIC will achieve a constraint σ(r)=0.01 with two years of data taking. QUBIC is an international experiment, lead by APC, Paris with teams from France, Italy, United-Kingdom, Ireland, the United-States of America and Argentina.